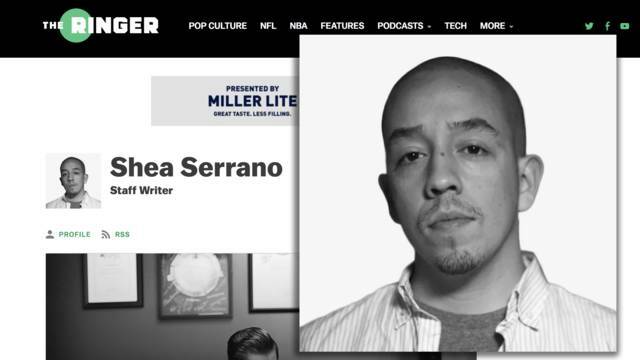 Since leaving teaching to compete with titans in the journalism industry, Shea Serrano has taken the game by storm. He’s landed two New York Times Best Sellers. His book, Basketball (And Other Things), skyrocketed to No.1 on the The Times’ Sports and Fitness list in 2017. He’s garnered praise from the likes of Questlove, Bun B and President Barack Obama. Despite all the praise and what we imagine is a very busy schedule, Serrano still found time for a quick phone call with 4MP to discuss everything from working at The Ringer to Manu Ginobili’s baldness. Check it out below. 1. What inspired you to leave your job as a middle school teacher and focus on writing full-time? Money. Teaching was a job that I wanted to do for the rest of my life. Thought I was going to do it for the rest of my life and then I had the opportunity make more money writing, so I said well alright. 2. How would you describe your writing process? What muses do you use when creating? My writing process is very structured and organized, which could surprise some people because how weird I can get. As far as the music I listen to, I try to pick stuff that sort of melts in the background to limit distractions. I usually pick stuff like 808s and Heartbreaks to write to, Erykah Badu is really good to write to, Spanish music is really good -- like old Norteno music, I just need it to be slower and I can get the job done. 3. How did you wind up linking with Bill Simmons? I was freelancing for a bunch of places and one of the places I was writing for was L.A. Weekly. I wrote a thing for them and then a woman at Grantland (which preceded The Ringer) who saw it. I started freelancing for them for awhile and then I ended up meeting him. When you work for him, all he cares about is if you write good stuff. It’s dope to have somebody that powerful backing you in the industry. All they want you to do is make stuff that you’re interested in. It’s not a spot where you’re worried about page views and never one time has anybody mentioned page views to me. All they care about is making good work and they have such good writers at The Ringer. It feels like a constant competition to see who’s the best person and it’s cool to be in a situation like that. 4. Who are you listening to right now, musically and which up-and-coming artist would you cosign? Tobe Nwigwe, this Nigerian dude from Houston and he makes music with this woman named Nell. He does the whole gravel voice thing, but the production Nell does with it is a really good combination. Their videos are really smart too, I just wrote an article about them on the Ringer. 5. So you’re stuck on an island and you either have listen to J. Cole’s album on loop for two days straight or root for the Dallas Mavericks to win a seven-game series against your beloved Spurs, what are you doing? Gimme Cole, it’ll be over sooner and once it happens, you don’t worry about the history of it. If the Spurs lose to the Mavericks in the playoffs, then I have to listen to that for the rest of my life. 6. You’re a two-time New York Times bestseller thanks to Basketball [And Other Things] and The Rap Year Book, what’s it like to have New York Times bestseller on your resume? It’s great. Once you get that tagged by your name, they start to take you seriously. Once you get No. 1 bestseller by your name, which I did with Basketball [And Other Things] it’s like this person becomes really legit. If i wanted to do a book now, it’d be much easier than when I first started. It’s like being Tim Duncan and winning an NBA championship, but the writing version, it’s good validation. 7. Growing up in San Antonio, how did Houston hip-hop influence you and where did your intrigue for the cities hip-hop culture begin? Houston’s always been big brother to the other cities in Texas. If things were cool in Houston, than it was cool later on in San Antonio. We always waited for Houston to do a thing and then San Antonio would follow. They were just the best at doing it and since I was in Houston and writing, it made sense for me to cover it. 8. You’ve used your platform to raise money for causes ala Hurricane Harvey and interact with fans via social media, how do you plan to continue to use your platform to impact and empower others? I don’t know. A lot of those things just sort of happened. Like earlier today, I made a joke about Manu Ginobili’s Game 4 performance on Twitter and people wound up sending extra $$ for one of my books, which I ultimately donated to an organization. We’ll just keep doing what we’ve been doing, picking stuff that moves me and I’ll try to support it when I can. 9. Speaking of Manu, how did you feel about him embracing his bald spot and taking the leap to cut it all off and finally go bald? I was kinda sad about it, honestly. I really want for there to be a player in the NBA to go bald and leave the hair on the side. It would be the best thing in the world to see LeBron dunk from the free-throw line with that hair. 10. What advice would you share with young, minority journalists looking to break in and find success in the industry? The first thing I would tell a writer is it’s very easy to get discouraged because you get told no or ignored so often. You might send 500 pitches over six months and be told no on 400 of them. Everybody’s going through that same stuff, you have to decide is that the reason I don’t make it or are we going to keep going. As long as you keep going, you’ll get where you’re trying to go. I didn’t have experience writing, didn’t go to journalism school and I just decided forget it, keep going and its worked out. I pitch stuff every week to the editors at The Ringer, send four or five ideas and they still say no to some of them. My book got a cosign from Barack Obama, which is a big deal and they still say no. Doesn’t stop me, I still keep going. I’d also say, you’ve gotta make sure you’re coming up with stuff that hasn’t been done a million times. If you’re doing the same stuff as everybody else, you can’t set yourself apart. You’ve gotta force people’s hand, if you’re the only person doing something, then it makes it much easier to produce and pitch the idea. Original ideas give you the foundation to be successful. 11. Like Bun B’s Rapper Coloring and Activity Book? How did you come up with that concept? I was playing around on Twitter one day while I was with the Houston Press and covering a lot of local rap. As a way to pass time, I drew a picture of one of the rappers and it got good feedback from some of the smaller artists. Bun and I were already in the process of making something happen and then I pitched it to him, and he was all for it.